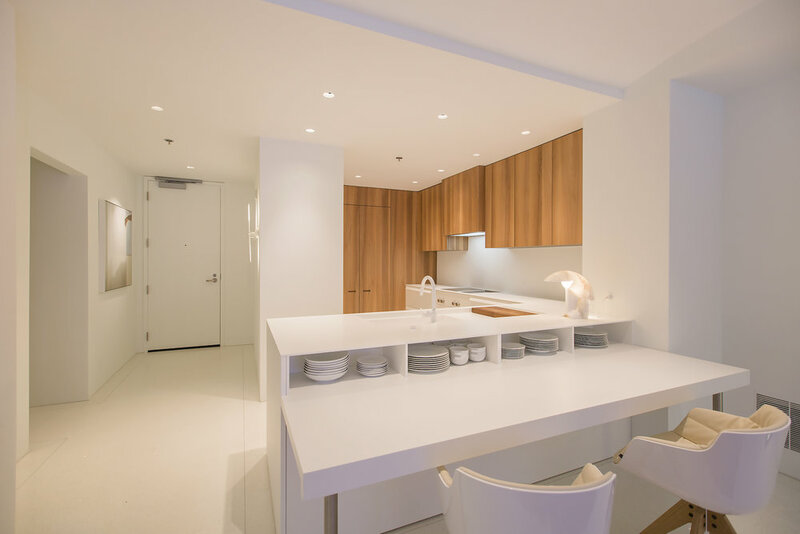 Perfectly positioned within the heart of Jackson Square, 845 Montgomery St #C is located in one of San Francisco’s most exclusive and historic neighborhoods. Renovated to the studs in 2016 with an impeccable attention to detail and the finest materials, the home is a contemporary masterpiece. The residence is appointed with two bedrooms, two bathrooms, a private deck, and one car parking. As you enter the home, you are greeted by polished white terrazzo floors that span throughout and beautiful recessed lighting to compliment a personal art collection. The exquisitely designed kitchen is outfitted with walnut cabinetry, Gaggenau appliances including a teppanyaki grill, Boffi countertops and cabinetry, and incredible storage. The kitchen overlooks the living/dining room, creating a functional open floorplan. A built-in dining space extends from the kitchen, allowing for intimate meals and an efficient use of space. Spanning the width of the home is an exclusive deck, which is accessed off of both the entertainment space and the master suite. The deck is appointed with white floor tiles, accents of brick and steel, as well as views of the TransAmerica Pyramid and the surrounding skyline. The master suite has been intelligently designed with access to the private deck as well as a sumptuous en-suite bathroom. The bathroom is steeped in luxury with Italian glass mosaic tiles, Boffi vanity, Aboutwater fixtures, a walk-in shower, and a European-style soaking tub. The second bedroom features stunning walnut-paneled walls and clerestory windows, creating a contemporary retreat. The second full bathroom has been thoughtfully appointed with Aboutwater fixtures and access to the Italian glass mosaic tiled shower. Completing the home is a laundry closet, accessed off of the kitchen, which also provides additional storage. 845 Montgomery St #C is located in a boutique building with elevator access to all floors, including the garage. Originally built in 1911 as a hotel, the building was converted to 12 private residences in 2007 and maintains the original brick façade and decorative cornices unique to the neighborhood. Quaint tree-lined streets, Gold-Rush era architecture, Michelin-rated restaurants, and boutique art galleries make Jackson Square one of San Francisco’s most sought-after and exclusive neighborhoods. With history dating back to the 1850’s, the neighborhood has maintained an incredible sense of history and prestige. Located within steps of incredible restaurants, boutiques, art galleries, and cafes as well as a short walk to the Financial District, North Beach, Chinatown, and the future Central Subway transit line, 845 Montgomery St is in the heart of it all.